Everywhere you look right now, you will find a recipe whose star ingredient is pumpkin. That’s October for ya’. Who doesn’t love pumpkin anything in the fall? You certainly won’t find our family griping about too much of this tasty orange squash. You know what else I love? 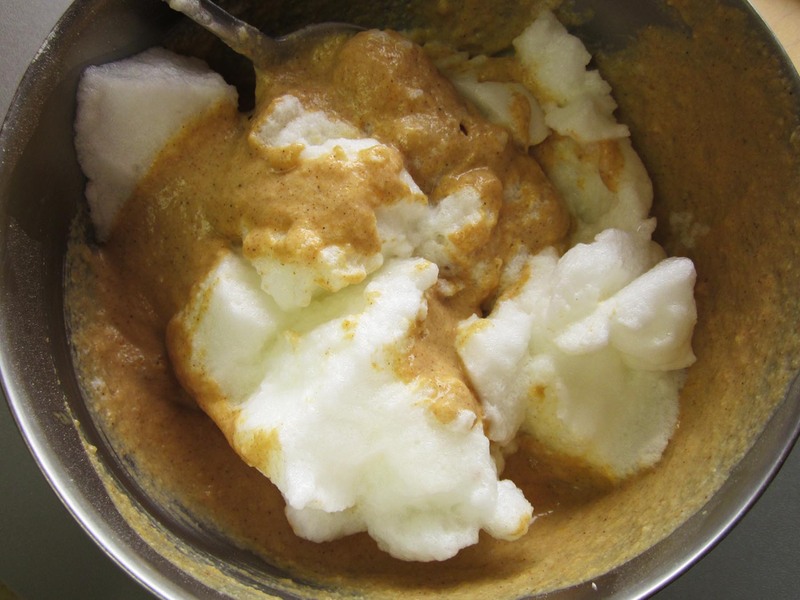 Food that can be made in batches and then frozen for effortless meals in the future. This is one of those perfect make ahead meals. 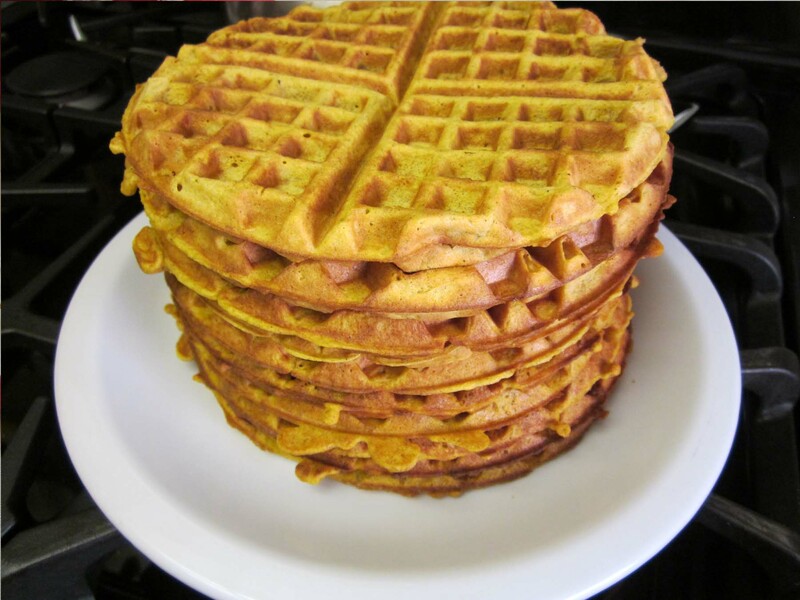 The recipe below yields 10 round waffles (a standard Cuisinart waffle maker). I made two versions of this, as I often do: a gluten free one, and a wheat flour one. I tried a new gluten free mixture this time. I have wanted to try using oat flour for quite a while. Something about fall flavors (especially pumpkin) seem like the perfect choice to try out this flour on it’s introductory run. 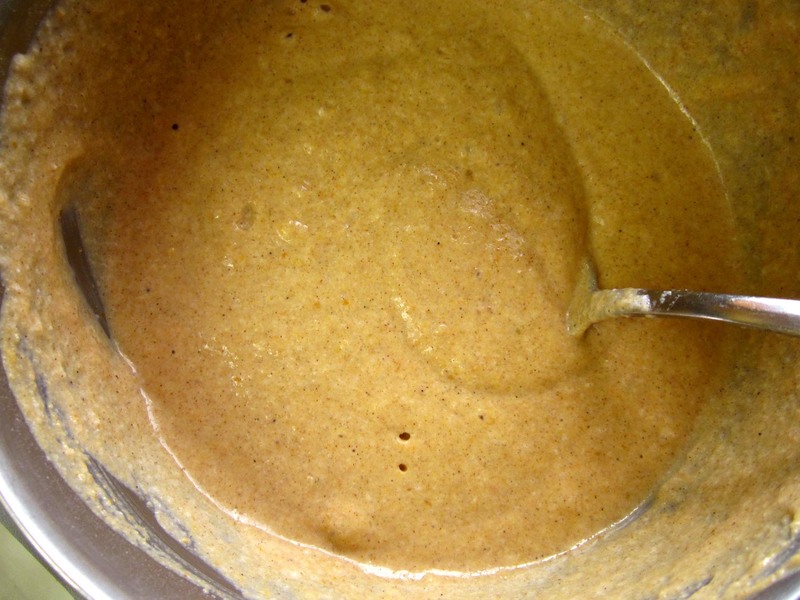 I have taken the recipe for my all-purpose, gluten free mix, and simply swapped two of the flours out for oat flour (click to see the oat flour version). Yum. Just, yum. So perfect. If I keep coming up with tasty gluten free recipes such as this one, my yearning for many baked goods and pastries containing wheat will be only a memory. 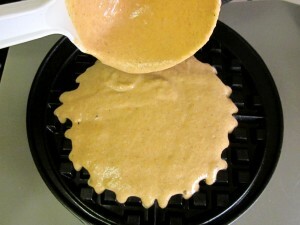 Pour a ladle-full of batter into the center of a waffle iron. A gluten free and regular flour version of a fall time favorite. Yields about 10 large, round waffles. 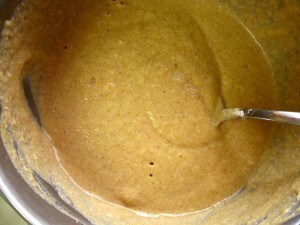 In a large bowl, combine flour, baking powder, cinnamon, allspice, ginger, salt, and xanthan gum (if using), mix well. Add the pumpkin, milk, egg yolks and butter. Mix well to combine. 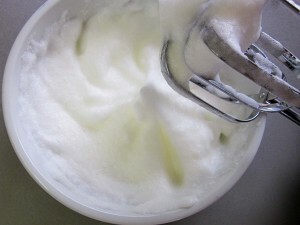 In a separate bowl beat the egg whites with an electric mixer, until soft peaks form. Using a large spoon or spatula, gently fold the egg whites into the pumpkin/flour mixture. Into a heated, electric waffle maker, pour a ladle-full of batter into the center of the waffle plate. Cook according to manufacturer instructions. These freeze perfectly. 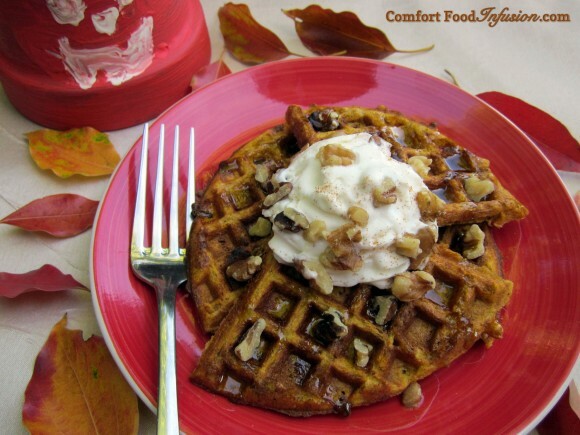 Simply toss a frozen waffle into the toaster like you would an Eggo waffle.